Check off your Christmas Shopping List Early this Year. This festival runs from February 28th - March 20th, 2016 and is a perfect something special for that cultural, artistic and has a love for live music. Click here for more info. This year marks the 20th Anniversary of this popular Festival held in the downtown core at the Paramount Theatre. We’ve had a sneak peak of some of the videos which we are so excited about. The lineup will be released shortly and will run from March 5th – 14th, 2016. Click here for more info. The ever popular Kamloops Cowboy Festival is the largest of its kind in Canada. Full of jam sessions, western music, dinner theatre and heritage, this festival will deliver! This Festival will be from March 17th – 20th, 2016. For more info, click here. 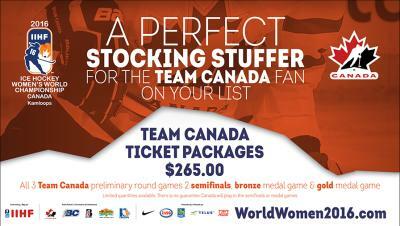 Kamloops is proud to be the host for the 2016 IIHF Ice Hockey Women’s World Championship next year from March 28th – April 4th, 2016. This will mark the first time in the events 26-year history that it will be held in British Columbia. Tickets are available now and you can check one more thing of your list. Get a family pass at Harper Mountain and ski, board or tube! Head out for a snowshoe day at one of our may trails in and around the city. Have you ever tried cross country skiing? Pop over to Stake Lake and enjoy a day together - don&apos;t forget to pack the hot cocoa! There’s plenty of time and copious holiday gift ideas for this magical time year. Get started, avoid the lines and settle in for a merry, stress-free and fun holiday season!